So, Monkish Brewing out of Torrance, CA has become the new "it" brewery over the past year. Very slowly, but surely, their name began taking over the trade forums (and demanding quite the asking price). Even for someone who has (pretty much) constant access to Trillium, it is still nearly impossible to find someone who will trade their Monkish cans with you. I've read stories where people will line up at Midnight for a release the next day just to get one 4-pack. It is this type of hype that has made Monkish into a "must have" brewery. What makes them so special? Well, they have apparently adopted the New England style of IPA, which is a radical (borderline sacrilegious) move being on the West Coast. 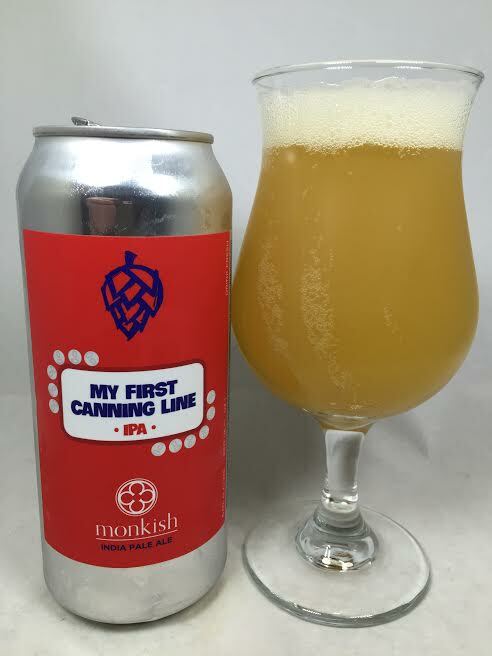 I was able to finally land some Monkish cans (thanks, Edward! ), so I am ready to see what the excitement is all about. Pours a murky, hazy golden yellow with a finger of white head. I'm immediately hit with lemon and dank hops on the aroma with a touch of grass. Citrus is the big player here and it has nice, bitter ending. The taste is dank all the way, but it is combined with enough citrus to not be too overpowering. Lemon and orange zest dominate all, but without acidity. The dankness of the hops also covers everything in its wake like a tornado of bitterness. As it moves through the middle of the mouth, this surge of pure hop juice comes into play, but again, it isn't an overbearing, bitter bite, and is really just all hop flavor. However, it does get bitter on the finish, but that refreshing citrus zest helps push it through. Mouthfeel is relatively calm, but has good carbonation. The body is what it should be for 6% and the drinkability is high. I will admit that it got noticeably dry, but everything else is so good, I can let it slide. My first Monkish beer was a success. From the moment I poured it into the glass and had my first sip, it drew immediate comparisons to Trillium beers. In this case, this was like a clone of Congress St IPA with the high levels of Galaxy hops. My obvious first observation is that this is not the typical "West Coast IPA" as Monkish has gotten the New England style perfected. Thumbs up from me on this one and I can't wait to dive into my other cans.